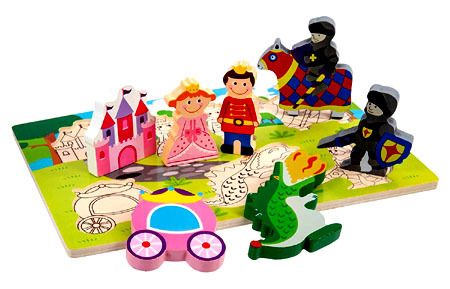 Princess Chunky Wooden Puzzle is a beautiful fairy-tale creation with seven movable pieces and a solid wooden baseboard. A dragon, 2 knights, a pink carriage, castle, prince and a princess make up this kingdom and I am sure many stories will follow. The base board has simple line drawings in the cut out shapes as a guide to help find the correct place for each piece. Size: 31 cm long x 20cm wide x 2.2cm thick. We like this because: "Beautiful creation which will spark the imagination."